The BEL 130 is a quick change, semi-automatic, pressure sensitive, uniform case taper. It is a sturdy, quality built semi-automatic bottom belt case taper designed for simple and convenient tape application. Equipped with state of the art DEKKA High Performance tape heads and quick 30 second size changes, the BEL 130 semi-automatic case taper can seal a wide range of case sizes at speeds up to 30 cases per minute. 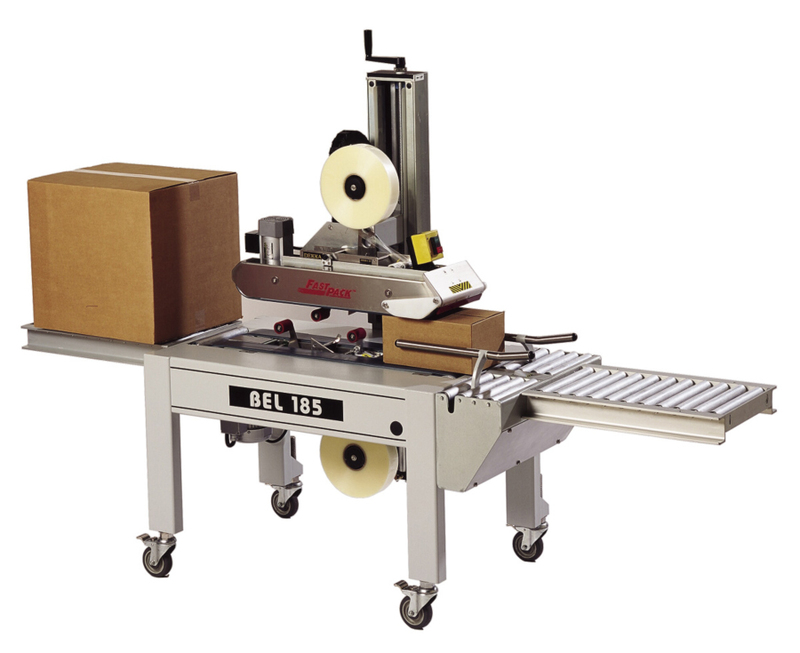 The BEL 130 pressure sensitive case taper is an ideal choice for packagers presently hand taping cases but wishing to automate at a practical investment cost. The BEL 150 is a uniform, pressure sensitive, semi-automatic case taper. It features heavy duty corrosion resistant aluminum C-Beam construction and a powerful Uni-Drivecase transportsystem. The BEL 150 semi-automatic case taper can seal a wide range of case sizes at speeds up to 30 cases per minute with quick case size changes. The DEKKA High Performance stainless steeltape headisa standardfeature. Simple design and rugged construction will deliver years of reliable, low maintenance performance. The BEL 150X is an oversized, uniform, pressure sensitive, semi-automatic case taper. The BEL 150X oversized model has all the quality features of the BEL 150 pressure sensitive case taper with the added bonus of a larger frame and drive system for large case capacity. The BEL 150X semi-automatic uniform case taper is user-friendly enabling the operator to make box size changes from either side ofthe machine in30 seconds or less. The BEL 180 automatically adjusts for cases that vary randomly in both width and height when they are presented to the sealer. The height and width adjusting mechanisms have locking movements for safetyin case ofsudden air loss. The adjustments can also be fixed in position for sealing a series of uniform size cases. Cases are taped top and bottom with either 2″ or 3″ wide tape using Dekka stainless steel tape heads. 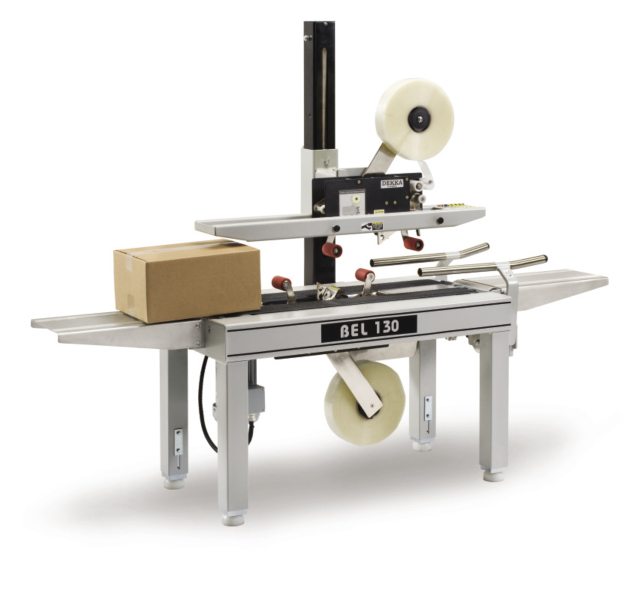 The BEL 185 is a semi-automatic random top & bottom case sealer. It conveniently self-adjusts and applies pressure-sensitive tape to various size cases, providing improved productivity in case sealing lines. Ideal for continuous, multiple-size case operations, the BEL 185case sealerautomatically sizes independently to each case, eliminating the need for manual adjustments. 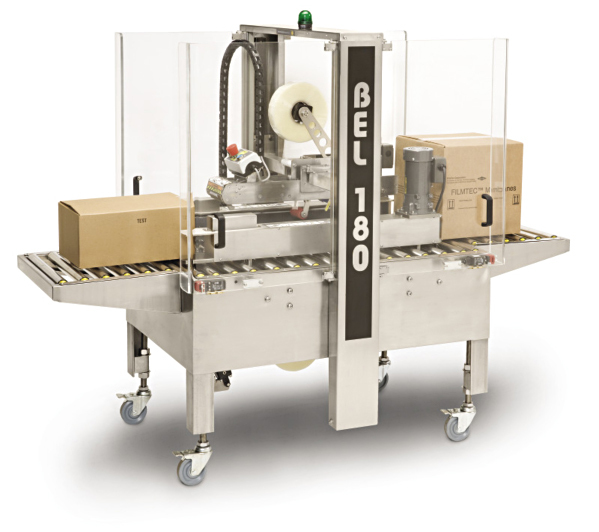 The BEL 185 semi-automatic, pressure sensitive, random case taper allows one person tolink caseforming, case packing, and case sealing of corrugated cases into a single operation. It also converts to a fixed position sealer for uniform case sizes. The superior performance and safety provisions of the BEL 185 offers operator comfort and increased productivity above that of similar case sealers. The BEL 185 is equipped with DEKKA High Performance stainless steel tape heads. Withthe designand construction will deliver years of reliable, low maintenance performance. The BEL 252 is a fully automatic, pressure sensitive uniform case taper. It is an affordable high quality fully automatic case taper that offers highlyadvanced productionduty design. No other brand of automatic case taper compares with the BEL 252 for compactness, safety, quality of construction, operating performance and value. The BEL 252 fully automatic, uniform case taper is a perfect choice forthe productionpacker looking to automate case sealing lines at a practical cost. Machine Speed Up to 25 cases per minute depending on box size. 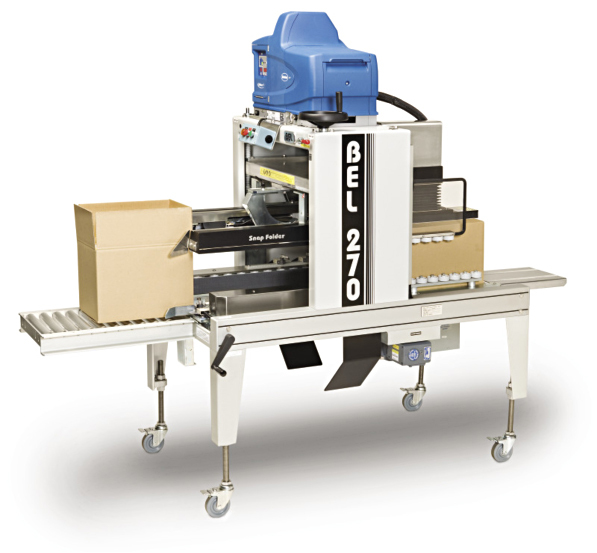 The BEL 270 is a fully automatic uniform hot melt glue case sealer. It is a continuous duty hot melt gluecase sealerunmatched for compactness, quality of construction, safety and operating performance. At58 inches(1,473mm) in length the BEL 270 is the most compact automatic hot melt gluecase sealeravailable. Corrosion resistant, heavy duty construction anodized high tensile aluminum, plated steel, stainless steel and engineering grade plastics ensure that BEL machines stand up to the most demanding production environments. 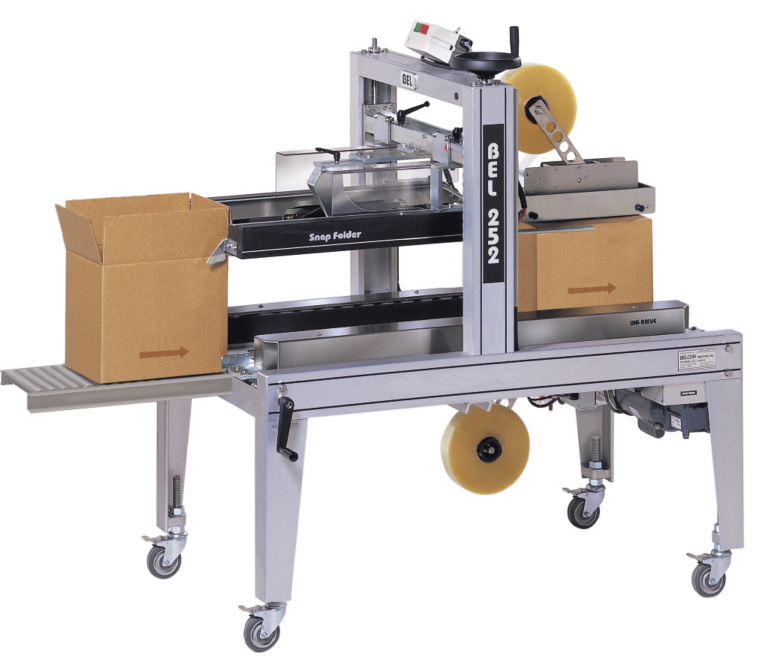 BEL automatic case sealers feature BEL’s Snap Folder safe flap folding technology. This revolutionarynew designprotects the safety of personnel by eliminating the traditional “flap-kicker” which can cause serious injury. The BEL 270 hot melt gluecase sealeris user-friendly and very simple to operate. A case size change can be completed from either side ofthe machine inunder one minute using two hand wheel adjustments. The BEL 270 fully automatic hot meltcase sealercan be fitted with all popular brands of hot melt glue application systems. BEL’s unique static compression system provides quick uniform bonding of adhesive for positive case sealing at speeds up to twenty-five cases per minute. The system seals cases with a gap free top closure on regular RSC cases providing superior dust and light hold out qualities. The BEL 270 hot melt gluecase sealercan also be configured to run lower cost Gap Flap style, as well as FOL-Bag in box style cases. The BEL 505 is a semi-automatic case former / case erector and pack station. It is extremely compact and designed specifically for application on manual case packing lines. 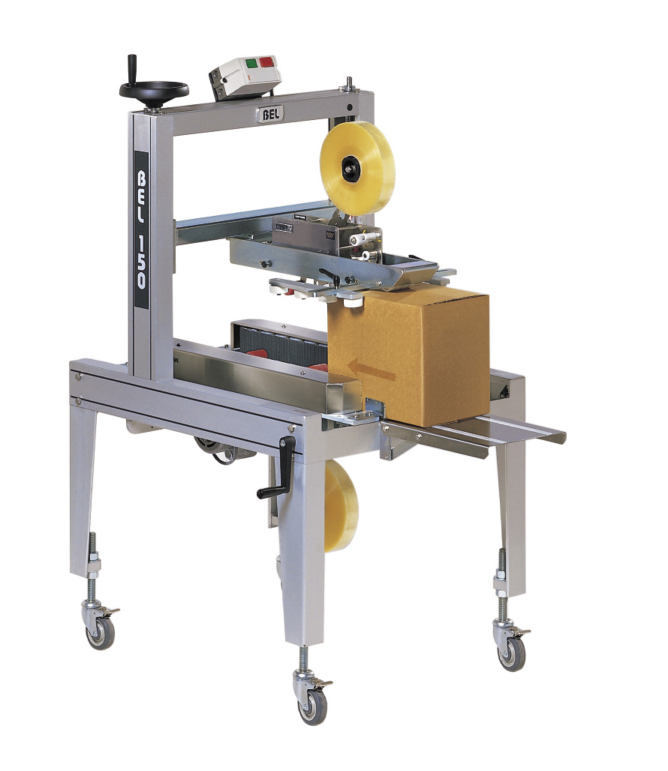 When connected to any BELcase sealer, the BEL 505 case erector machine enables one person to form, pack and seal corrugated cases in a single operation. 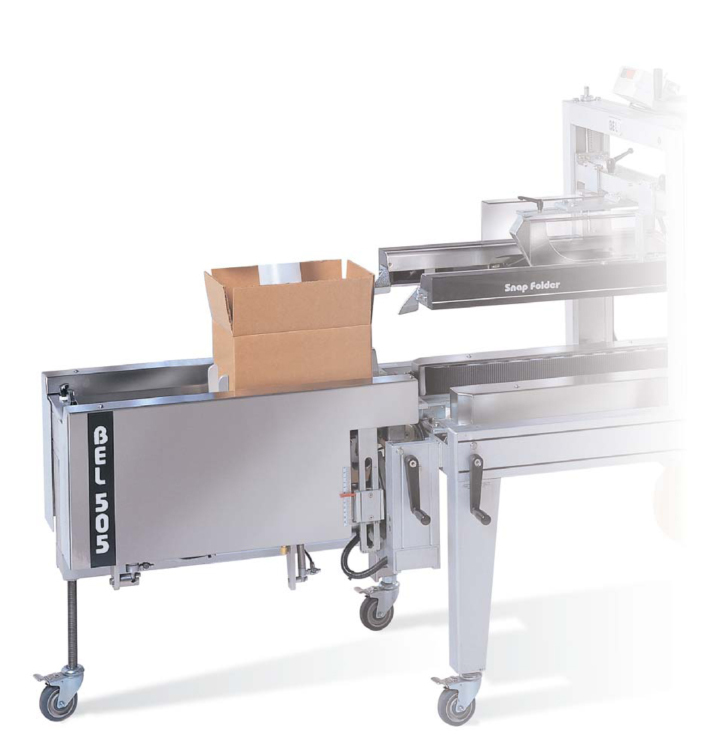 Installing the BEL 505 semi automatic case former in manual packing lines improves productivity and eliminates extra labor needed to set-up and close case bottom flaps prior to loading. Safety is improved by eliminating costly repetitive strain injury problems. At a fraction of the cost of fully automatic case erectors, the BEL 505 semi-automatic case former provides an economical and effective way of minimizing manual labor. The BEL 505XL is an oversized semi-automatic case erector and pack station. The designof the BEL 505XL is based upon the highly successful BEL 505 semi-automatic case former, which today can be found operating in countless manual packing lines throughoutNorth America. Pairing the BEL 505XL Semi-Automatic Case Former with a BEL case sealer enables one person to form, pack and seal difficult, large dimension RSC corrugated cases. The BEL 505XL semi-automatic case former further reduces labor cost by eliminating the need to manually pre-assemble and store cases prior to packing. The BEL 505XL semi-automatic case former is simple to operate and adjust. Case size changes are made without tools by the operator in less than one minute with easy to use hand wheel settings.